For fans of indie cinema, Gloria Bell might look familiar. That's because writer-director Sebastián Lelio's latest film is an almost scene-for-scene English language re-make of his own 2013 Chilean drama, Gloria. This time around, Julianne Moore gives a triumphant performance as the achingly vulnerable Gloria; an unapologetic disco diva who bravely invites new love into her life regardless of the consequences. Observant, delicate, and painfully human, Gloria Bell tears apart the constrictive social roles crippling its heroine and finds a vibrant survivor yearning to be heard. Early in Gloria Bell, one character muses that our cells are constantly dying and being replaced, yet we remain essentially the same person throughout our entire life. If we follow this biological metaphor deep into the subconscious of Lelio's treatise on middle-age love we discover these cells are akin to the various roles we play in our life. 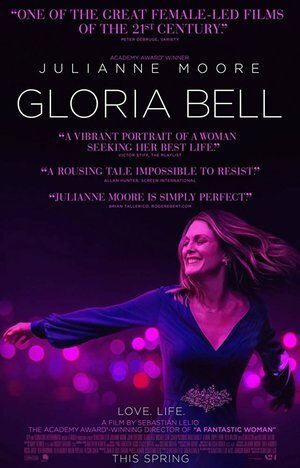 Gloria Bell (Moore) has been a daughter, a wife, a mother, an ex-wife, a co-worker, and a lover. The DNA coiling between these social constructs reads like a template for the traditional female nurturer. Gloria exists to make the people in her life – primarily men – feel better about their lives. Her happiness and self-worth are merely a byproduct of her success as a nurturer. Gloria's only personal indulgence is dancing. After working all day in her cubicle as an insurance claims agent, she makes a pilgrimage to the nightclub; nursing her drink at the bar until the right song finally overcomes her inhibitions (perhaps it's her personal anthem, the vaguely empowering pop classic "Gloria" by Laura Branigan). She finds a harmless middle-aged man on the dance floor and shares a few moments of awkward physical connection. When she makes sustained eye contact with another lonely soul named Arnold (John Turturro), we aren't sure if her attraction is rooted in physical lust or her compulsion to ease his obvious sadness. For Gloria and Arnold, making love isn't nearly as intimate as the quiet moments that follow. A physically and emotionally naked Gloria is free to unpack the decades of frustration trapped in her knotted shoulders. Predictably, much of her and Arnold's personal turmoil revolves around their adult children. Gloria's daughter (Caren Pistorius) is in love with a big-wave surfer, while her son (Michael Cera) is taking care of their newborn baby while his wife is away "finding herself" in the desert. Arnold's deadbeat daughters laze about all day with their troubled mother, who concocts new and exciting ways to make him regret his decision to leave home a year prior. When Arnold and Gloria abscond to Las Vegas for a romantic weekend, Arnold's ex-wife conveniently walks through a glass door and cuts her legs to ribbons. The prospect of personal liberation quickly becomes yet another trap for Gloria, whose relationship with Arnold metastasizes into obligation, guilt, and regret. Lelio (fresh from his 2017 Academy Award winning triumph, A Fantastic Woman) depicts their doomed relationship with an unwavering attention to detail and a cautious rhythm befitting such a mature entanglement. This is seasoned, observant storytelling that understands torrid and reckless escapades are the luxury of youthful romance. Every tiny decision Gloria makes, such as obsessing over whether to answer Arnold's increasingly desperate phone calls, is laden with prospective disaster. Is she being cruel to not answer Arnold's calls? Will she be leading him on if she does answer? Is she his lover or his mistress? These aren't simply new questions for Gloria; this is a new role for her, with confusing rules and hidden traps. She may emerge to the other side stronger and more empowered, but this fledgling independence conflicts mightily with her accommodating instincts. Moore is an inspired choice to assume Paulina García's role from Gloria. She has an almost terrifying emotional range, and has never feared coming completely unhinged when the part requires it. Indeed, if Moore had a spirit animal, it would probably be Nicolas Cage. In Gloria Bell, however, she remains firmly buried within herself, content to swallow the rage and hysteria that punctuate her career-defining performances in Todd Haynes' Safe (1995) and Paul Thomas Anderson's Magnolia (1999). It's the measured uncertainty you expect from a character caught somewhere between where she's been and where she's going. Moore commands every scene, despite the lack of flashy emotional epiphanies. Simply put, she is exquisite. Sadly, Gloria Bell indulges a few too many indie tropes to garner an unqualified recommendation. As mentioned, there's an obligatory trip to Vegas that ends with predictably chaotic results. There are some unwelcome broad gags, such as Gloria's experimentation with marijuana and a wacky co-worker who feels woefully out of place. Even some of the drama feels forced, as when Gloria takes Arnold to a family dinner party to meet her ex-husband (Brad Garrett). Most egregious, there's a pesky neighborhood cat that keeps finding its way into Gloria's apartment. Perhaps these are just flourishes meant to broaden the film's accessibility, but they seem disingenuous compared to the otherwise naturalistic tone. What Gloria Bell captures splendidly, however, is one woman's struggle to break from society's script and author a new chapter in her own life. It seems the older we get, the more constrictive the plot lines become. 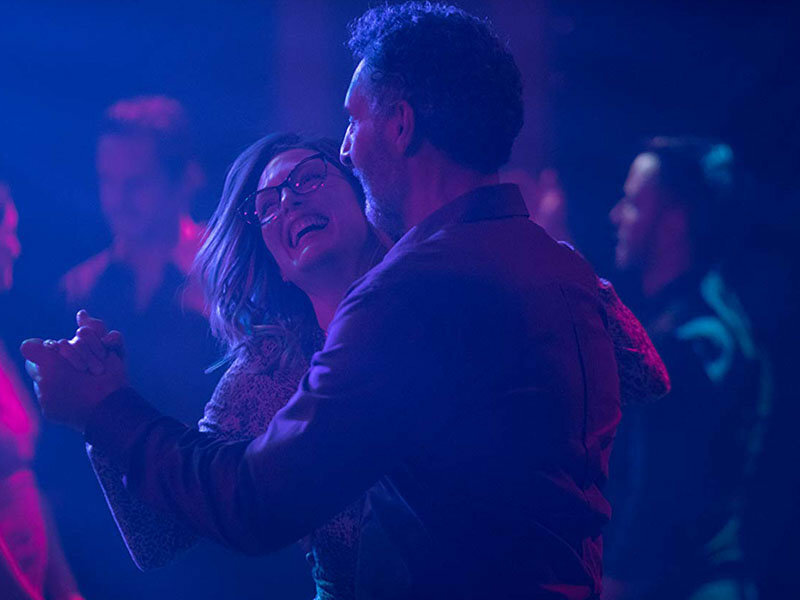 For those curious about what awaits them on the other side of youth, Gloria Bell offers a sympathetic, unflinching glimpse at some very unforgiving terrain.